It’s been almost a year that I started this blog, but I still haven’t written about Turku Castle, turun linna in Finnish. So here it is. There are multiple reasons for writing about Turku castle. The first is simply how emblematic of Turku it is. Together with Turku cathedral, the castle is on of the trademarks of Turku. There are other reasons to write about it though, its rich history being one. I will mention before going any further that the castle is absolutely worth visiting in person. Pictures and words can’t really give a proper idea of how it feels to explore the inside of this impressive construction. If you are interested to visit, the castle is open from 10 to 18 everyday except Monday. Turun Linna in 1845. Notice how close the water comes to the base of the castle. Back when Finland was part of the Swedish kingdom, Turku’s status and location meant that it was a key location. Strategically located at the entrance of the Aura river, the emplacement of the castle was not chosen at random. Interestingly enough, the castle was then on an island. Around 1280, when the construction started, the plans were also much smaller then what you can see now. In days when authority came directly from military might, a castle was an excellent way of controlling the surrounding lands. The castle was thus used both as a fortress and as an administrative center. The inner courtyard of the medieval part. Source. Through its long existence, the castle has gone through numerous modifications and expansions. It has also had its fair share of fires and sieges, also resulting in changes to the structure. The best way to appreciate this can be found nowadays in the castle, where a room holds a series of small scale models illustrating the evolution of the castle grounds and its surroundings. Turku castle in 1941, after the soviet bombardments. Source. Closer to us, Turku castle was severely damaged during the war with Russia. Its reconstruction was completed only in 1987, and it has been a museum since 1993. Worth mentioning is the fact that Turun Linna is the biggest remaining medieval building in Finland. The tomb, in Turku Cathedral, of Karin Månsdotter, former Queen of Sweden. Source. Interestingly, Turku castle hosted both future and former members of the Swedish royalty during the renaissance period. Some traces remain even to this day. Karin Månsdotter, then Queen of Sweden was taken to Turku castle under house arrest. She was eventually freed and spent the remainder of her life in Finland. She is actually buried in Turku Cathedral. The castle was also a prison for most the 19th century. Although it is absolutely worth a visit, Turku castle is not only a museum. Its charming chapel is sometimes used for weddings and religious services. The imposing hall is also used by the city of Turku for ceremonial events and can also hosts other events. If you do visit the castle, be ready to be surprised. I personally found that even though it looks imposing from the outside, the castle is much bigger than expected from the inside. The winding paths and labyrinth-like corridors, typical of medieval castles, lengthen substantially the visit and make it easy to go back in time. Did you know that some of the biggest cruise ships in the world are built just a few kilometers from Turku? In fact, the third biggest cruise ship ever built, Allure of the Seas, was constructed in the Meyer shipyard, in Turku. 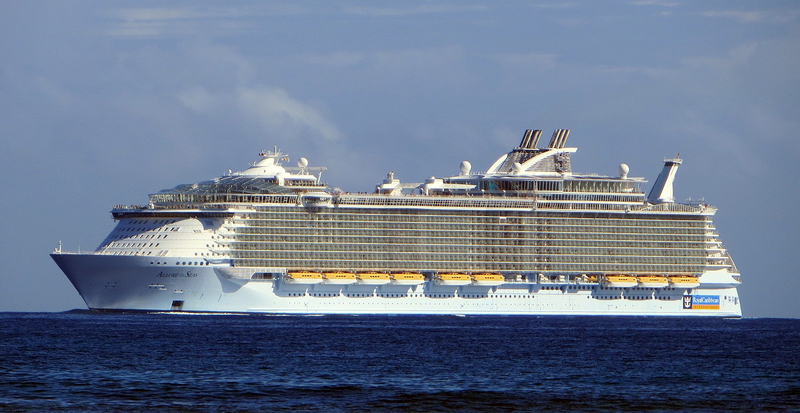 The Allure of the Seas. Source. One of the most prominent businesses in South-West Finland, Meyer Turku is the company behind these achievements. With more than 1,700 employees, Meyer Turku is a the center of the ship building industry in Finland, and arguably, worldwide. Very few shipyards can boast of assembling ships of this size. It is not a coincidence, however, that Turku has such a dynamic shipbuilding industry. Shipbuilding in Turku has a long history. With its proximity to the Baltic and active maritime traffic, that’s not very surprising. The first official shipyard opened in 1737, the start of a long (and very complicated history), which leads us to the current Meyer shipyard in Turku. A simple timeline of shipbuilding in Turku, from 1737 to today. Credit: Meyer Turku. Turku’s shipbuilding history is also intertwined with that of neighboring cities. If one thing is certain, however, it is that this rich history has a suitable heir in Meyer Turku. The MS Independence of the Seas under construction in 2007. Source. As mentioned above, Turku has witnessed the construction of numerous huge ships. You can actually find a list of the ships built here, starting from the 1960s. Just have a look here. The future also looks bright for Turku’s shipbuilding industry, with orders in the books for the next decade. A focus on clean and efficient ships has helped Meyer Turku keep an edge on competitors. For instance, one of the shipyard’s latest ships, Tallink Shuttle’s Megastar was the world’s fastest Liquid Natural Gas (LNG)-propelled ferry. Tallink Shuttle’s megastar, the world’s fastest Liquid Natural Gas (LNG)-propelled ferry. Source. I arrived in Turku almost five years ago, in august 2013. Since then, I have been both an exchange student and a degree student. After all this time, I still love Turku and today I just want to share why I think Turku is a perfect city for students. Ok, ok, Turku can’t rival big metropolis in terms of nightlife, events of all kinds, etc. Turku is also too big to be considered a town. However, it combines the best of the two in many ways. With about 180,000 inhabitants, Turku can provide all the services needed for one’s everyday life, and more. There are plenty of charming little pubs, as well as a satisfactory number of clubs. The choice of restaurants is excellent, and there are plenty of events, particularly during the summer. Turku even hosts a gigantic music festival every summer! (Ruisrock). On the other hand, Turku isn’t as intimidating as other big metropolis in Europe. Even compared to Helsinki, Turku feels like a calm and relax city, where one can stroll around in peace. Turku also has an excellent public transportation system, which allows one to explore the city and its surroundings. Though I agree that connections with other European cities are limited, Turku still enjoys an excellent position to visit other places. Its direct ferry connection with Stockholm is perfect for a weekend trip in one of Europe’s most beautiful cities. The cheap flights to Gdansk are also an opportunity to visit another of Europe’s historical cities. More than that, Turku is sitting just next to the archipelago, which is both unique and gorgeous. And even though this point is common to most Finnish cities, Turku’s proximity to the countryside makes it very easy to get some fresh air by hiking in the forest in Kurjenrahka, or swimming in Ruissalo. Since you are reading this on TYS’ website, I won’t pretend I’m not biased, but still, I think the student village is a wonderful thing. The concentration of the student population makes it the perfect setting to meet and hang out with fellow students. After my first year in Turku, I had to go back to Canada to continue my studies, and this aspect of student life in Turku was probably the one I missed the most. Having your friends within a 2-3km radius is simply awesome! With at leas four different universities (University of Turku, Åbo Akademi University, Turku University of Applied Sciences, and Novia), Turku offers plenty of choice for students. In fact, university students make up a bit more than fifteen percent of Turku’s population. In addition to this, the numerous student associations, such as ESN for exchange students, create a very dynamic atmosphere. The famous Posankka, or Pigduck. Altogether, it’s pretty easy to argue that Turku is a good place to be a student. Yes, it could be closer to the ferry to Tallinn, but Turku has a lot to offer. Let me know what you think: why is Turku as great student city, or why do you disagree? Ever seen scissors like that? Source. In 1649, a dutch merchant was being granted a license to operate furnace in a small village, Fiskars. Though the iron ore was to be imported from Sweden, the operation was still deemed profitable. Somewhere between Turku and Helsinki, one of the great Finnish companies was born. Since Peter Thorwöste, the company’s founder was prohibited from manufacturing cannons, he instead focused on nails, horseshoes and other similar items. The village. Credit: Visit Raseborg. After shifting its focus to cutlery in the early 19th century, the company eventually became listed on the Helsinki stock exchange in 1915. Though already relatively successful before, 1967 was Fiskars’ breakout year with the commercialisation of its most famous pair of scissors. This success soon translated into expanded operations, including an expansion in the american market, in 1977. Military equipment for the US Marines. Source. Part of why I’m writing this blog is because I was surprised to learn that Fiskars was a Finnish brand. Coming from Canada, it is well represented there, and its products are reputed for their quality. Beyond manufacturing ergonomic scissors, the company now manufactures a very wide array of products, from Finnish design to US Army equipment. Since it owns Iittala, Fiskars is also directly involved in the production and commercialisation of Finnish design. Just to give you an idea of how big the little ironworks have become, the company’s assets are estimated to be worth around 1.7 billion euros. With more than 8,500 employees, it is fair to say that things have changed since its foundation. The village of Fiskars is definitely worth a visit. In addition to being very picturesque and relatively close to both Turku and Helsinki, it hosts the Fiskars museum, and it is still possible to see a number of the old ironworks buildings through the village. Now that July is here, let’s talk about Turku’s biggest festival: Ruisrock. Before getting into this year’s programme, let’s first get some background on what is Ruisrock. It might be a surprise to some of you that Ruisrock is generally considered to be the 2nd oldest rock festival in Europe. Though it claimed to have the title for a number of years, it appears that Pinkpop is the legitimate holder, founded just a few months before. Ruisrock was officially founded in 1970, and has been running every summer since. One of Ruisrock’s specificity is it’s location: the island of Ruissalo, just outside Turku. Set at the edge of the water, the unique configuration of the festival grounds allows a little armada of boats to enjoy the music from water. The festival is also located just next to the usual route of the ferries leaving Turku’s harbor. This create the opportunity for pretty awesome photos. The view from the MS Baltic Princess, in 2016. Source. With up to 105,000 festival-goers attending every year, Ruisrock has been able to attract quite a number of big names through it’s long history. To name only a few, bands such as Metallica, Oasis, Ozzy Osbourne, Rammstein, U2, Aerosmith have been programmed through the festival’s history. The artists this year include The Chainsmokers and Dua Lipa, among others. You can have a look on the official website to know more. The waterbus provided by Föli can get you to Ruisrock almost directly, avoiding the traffic. Credit: Föli. You should know, however, that finding tickets at this point might prove challenging since the dates are coming soon. The festival will take place from the 13 to the 15th of July, this year. If you can’t find, there is always the option pioneered by ”duckman” Timmi Tuutti, who, last year, tried to sneak in disguised as a duck. More precisely, swimming as a duck. I’m kidding of course though, don’t do that! (But if you want to know more, have a look here). Now that the construction of the new TYS building will start soon, it is time to say goodbye to one of the most cherished locations in the student village: Three Beers. Well-known to students for its excellent choice of beers and friendly staff, Three Beers was the perfect place for a cold beer and a good conversation. Even though I got to know this mythical place only in 2013, I wanted to write this blog to remember it and the fun we have had there, and as a tribute to a student village monument. Credit: Three Beers’ facebook page. Since Three Beers has been a part of the student village since 1989, it has seen quite a lot change around it. Countless students have gone down the staircase, and the graffitis in the men’s room can attest of the creativity of some. Three main things made Three Beers an icon of the student village. The first was its, as previously mentioned, wide choice of beers. I have to say that you could find more choices of beers in Three Beers than you can in the equivalent of Alko in my home province of Québec (no kidding!). We shouldn’t forget the student-friendly prices, without which most students would remain thirsty. Three Beer’s second big advantage was simply the variety of entertainment it provided. From a wide variety of board games to pool and live sports events, the bar also offered concerts regularly. A sample of the board games selection. Last simply was its proximity to the student village. Located at its heart, it was the perfect meeting place for student village dwellers and various organisations. Its terrasse also offered a great place to make the best out of the few Finnish sunny days. Part of the reason why I’m writing this blog is that you can still visit Three Beers. Not really, but almost. Before the beloved bar closed, a team took the time to make a 3D-model of it. This allows us to visit it as if we were really there (minus the beer-drinking, sadly). And if you are a bit nostalgic, you will be able to get a taste of Three Beers in your living room. To access it, just have a look here. You will also be able to discover unexplored areas of the bar, including the storage rooms. Even though I would have liked to do this blog before Three Beers closes, I figured that it was better late than never. In any case, it was great to know you, Three Beers! We’ll miss you! Wondering where to go to enjoy the beautiful weather? Well, I have a good suggestion (you can also read about two more here): Vaarniemen torni. Some of the beautiful sights you will see going to Vaarniemen torni. Vaarniemen torni is an observation tower, located just within the territory of Kaarina. It takes about 40 minutes from the student village (TYS office) to get there, but probably less if you push it. You can have a look here to see how to get there. The way is not too hard to follow, and it is almost only on biking path. There are also only small uphills, so the level of biking difficulty is low. Don’t forget your water though, you will happy you brought some if the day is warm. It’s about 10km from the TYS office to the destination. What makes Vaarniemen torni a great bike excursion is both the destination and the road. Though the beginning is nothing exceptional, once you get to the outskirt of Turku, you will start seeing a bit the Finnish countryside and it’s picturesque farms. The best part is when you get close to the destination and the traffic diminishes to almost nothing. Though the last few hundred meters are on a gravel road, smell of the pines and charm of the surrounding fields compensates fully. What is waiting for you once you get to the foot of the hill is a flight of wooden stairs. Though intimidating at first, know that the view waiting is worth the effort. Once you get to the top, you will have to find the tower (torni is tower in Finnish). From there, you can enjoy the great view on the surrounding landscape (as well as all the graffitis left by random teenagers). Vaarniemen torni is a pretty nice bike trip. The way to get there is great, and the destination as well. You can bring a lunch and eat while enjoying the view. I would say to give yourself around three hours altogether, if you want to take your time. The K-Citymarket of Kupittaa is also on the way, so you can combine the trip with picking up your latest package from posti. There is also a number of hiking trails around that area, so you can combine hiking and biking. Due to the popularity of the previous Café post, I thought I could just do another top five. I will review today at a few coffee places I did not include in the previous one, but which, however, deserve a mention. This is an absolutely pristine and un-scientific post, feel free to criticize or add your comments under the post. Any feedback is welcome, and I would be happy to discover new coffee places in Turku! Sirius Café is the coffee place which is located within the main Turku City library building. Beyond the beautiful surroundings (if you want to learn more about the library, see here), Sirius Café also has a lot to offer. While Café Sirius offers pastries and a good choice of coffees, you can also order a warm slice of pizzas or other savory dishes during the day. Being so close to the library also means that it is the perfect place to read a gripping novel while enjoying a mocha or latte. Literally ”Square Café” in french, Café Carré is just next door from the previous entry on this list. With an excellent view on the river and the old part of the city library, its terrace is a great place to enjoy a warm (or cold) drink. The decoration of Café Carré is another great plus, adding indoor charm to the beautiful surroundings. Credit: Café Carré.The staff is very friendly, and Café Carré also offers ice cream, as well as some more salty dishes. What else could you ask for!? The third entry is POWAU, which you might know under the name Pure. POWAU offers a varied choice of organic coffee, in addition to smoothies, cakes, and generally, healthy foods. This coffee place is also very easy to find, since it is just across the street from every student’s favorite place: Lidl. If you have a particular diet or want to avoid unhealthy foods, POWAU is the place to be. While Latte Café is probably the smallest place on the list, it is a strong contender for the best coffee. The cozy café can be found on Kristiinankatu, in the center of Turku. Something that makes Latte Café unique is that it also has a mobile element with ”Latte on the road”, which is a moving café. The Latte on the road can be seen around during sunny days, allowing clients to enjoy both excellent coffee and the warm weather. Latte Café also has an excellent choice of tea, with a wide selection of both exotic and classic options. Latte Café also serves some delicious cakes, as well as some savory foods. Coming first this time is Tiirikalla, a charming café/restaurant, also very close to the Turku city library. Part of the charm of Tiirikkala is its location in a very old, wooden house. The decoration and configuration of the place offer a good choice of tables and atmospheres, among which the old attic is a personal favorite. Tiirikkala’s current location at the beginning of the 20th Century. Source. …and its current look. Credit: Tiirikkala. The reason Tiirikkala is first on the list is the combination of an excellent location, the unique atmosphere one can experience, excellent coffee choice, and the friendly staff. In addition to all this, you might be interested to know that Tiirikkala hosts regular concerts and events. Now that the cold season is behind, coffee places are an excellent place to enjoy the beautiful weather. Whether it is by drinking an ice coffee on a terrace, or simply enjoying a latte while reading a nice book, there are no bad moments for good coffee. Please let me know if you have any comment or information you would like to add. Turun Kauppahalli. Credit: City of Turku. Turun Kauppahalli, literaly ”Turku’s market hall” in Finnish, is a very picturesque building. You might know it for its fresh meat stalls, cafés, souvenir shop, or simply for its unique atmosphere. Today, I’ll review some of the building’s history and background. The destruction, in 1894, of the buildings that on the plot currently occupied by the Kauppahalli. The two buildings in the background on the right are still standing. The photo is taken from close to where Hansa is currently, on Eerikinkatu. Credit: Turun Kauppahalli. Due to Finland’s harsh winters, open markets are not suitable all year long. As a result, there has usually been a covered market for the dark months. In 1896, the insufficient hygiene in the previous covered market areas prompted the construction of the current market hall. The planning and designing of the new building was given to Gustaf Nyström, a prominent Finnish architect. Gustaf Nyström had also worked a few years earlier on Helsinki’s market hall, built in 1889. Helsinki’s covered market, built in 1889. It’s easy to notice some similarities in style and architecture. Source. The Kauppahalli was originally divided in 151 stalls, about one third of which were occupied by fresh meat merchants. A very lively market, the Kauppahalli also had a number of fresh fish stalls, some even featuring live fish in tanks, thanks to the introduction of running water in 1905. Electricity only came in 1932, however, the lighting had been provided until then by gas lamps. Modernisation of the stalls was slow, and it was only in 1957 that the first refrigerated counter was installed. Storage space had also become a problem by that time, and the building suffered from disrepair. The traditional spring cleaning, in 1942. Credit: Turun Kauppahalli. As a result, the planning and construction of the new Kop Kolmio building in the early 1960s, located just next to the market hall, was originally intended to extend over the plot occupied by the Kauppahalli. Thankfully for us, this plan didn’t materialize and the market hall was left intact. Many historical buildings were destroyed in Turku during this period, partly due to collusion between promoters and the city council. This was later called the ”Turku disease”, of which we can say the market hall is a survivor. Turku’s market hall, probably in the late 1970s or early 1980s. Credit: Turun Kauppahalli. Having secured survival, the covered market still needed extensive repair in order to have a future. The renovation was done in 1976, and though the facade was left intact, several changes took place on the inside. Primarily, the stalls were modernized, and some of them were fused together to make more place for some of the small businesses. The number of stalls was also cut in half to optimize the new space. In addition to the changes on the inside, a storage building was added next to the Kauppahalli. Today, Turku’s covered market is both a spot popular with tourists and a very nice place to shop. With its high ceiling, bustling shops, and historic charm, it is hard not to spend time exploring the alleys of the market. It is also perhaps the best place in Turku to shop for fresh meat or fish, due to the variety in choice and friendliness of the people. It is also an excellent place to have some coffee in the unique train café, a warm lunch in one of the restaurants , or even buy some souvenirs from Turku. Turun Kauppahalli is perhaps the best location in Turku for reindeer meat, since there is a stall specifically selling it. The 122 years old building is open during the week from 8.00 to 18.00, Saturday from 8.00 to 16.00, but it is closed on Sundays. If you want to have a look at the shops, or simply find some more information, you can visit http://www.kauppahalli.fi/en or find the Kauppahalli’s facebook page.